The ruler of Florence, Piero de’ Medici, ordered Michelangelo to make a snowman in the courtyard of his palace. He is usually censured for that and the snowman is cited as the supreme example of a patron’s abuse of an artist. How could anyone order a great genius to waste his time like that? But Michelangelo might have liked the idea—it may even have been his. And he must already have had an idea for a great snowman even before he greeted Piero. He could do a swell devil or monster of some kind. Or maybe a beautiful angel. Piero was a young man himself and he and Michelangelo had been friends since the days when Michelangelo lived in the Medici palace, invited by Piero’s dad, Lorenzo the Magnificent. And Michelangelo was probably half-way down the stairs before Piero had finished giving his “order”. What was the subject of his snow figure? What was it like? Life of Michelangelo, p. 332 in the Penguin Classics translation by George Bull. This entry was posted in art, art history, great artists, Michelangelo, sculpture and tagged snow sculpture, snowman. Bookmark the permalink. 20 Responses to The Greatest Snowman Ever? ‘The Greatest Invisible Snowman’ ever? Such a shame that Vasari didn’t at least give a slight clue as to what it looked like, how long Michelangelo worked on it, etc. But perhaps it’s better that it’s left to the imagination of the thousands of people who have read about it over the years. Happy to see the snow again, Swallows! Ken: I assume you mean the snowflakes falling on my blog, but maybe you mean the winter storm North America seems to be having. I miss the snow. Rich and Ken: I have to pass on the Six Persimmons. I can’t see much and so I’d better shut up. I like both Hopper and Homer but I never thought about their values. But now I will go value hunting. Yes I did mean the snow falling at the top of your blog. But now I could certainly refer to the 2 feet of snow we got last weekend. In any case we will be having a white Christmas here. A rare treat. And I hope you have a very Merry Christmas there! Ken: Thanks. I’m glad you had white Christmas. We had a very unusual snowfall a couple of days before Christmas, so I got to see what it looked like again. There was even enough to make a snowman. Happy New Year! It feels so odd to read those years 1494 and think those people really lived then. There was a day like that. And to think of the great artist at 19 and wonder how he saw the world and his future at that time. Bill: Thanks. Isn’t it odd that we have trouble imagining any other time when there is in fact so little difference between it and ours? Sure there was a snowy day and Michelangelo was a kid. Just then he may have seen his future as pretty dark because his patron Lorenzo had just died and he had had to leave the palace and go home to a poor and ornery father. Plus Lorenzo’s son, the one who ordered the snowman, was unpopular with the Florentines. They would soon get rid of him and Michelangelo realized he had better not be seen as too close to the tyrant. After a few months he decided to quietly leave Florence and get out while the getting was good–before the revolution. With Lorenzo he had had a privileged life, from now on he would have to fend for himself. I am sure it was a great snowman. It is a pity the camera had not yet been invented. 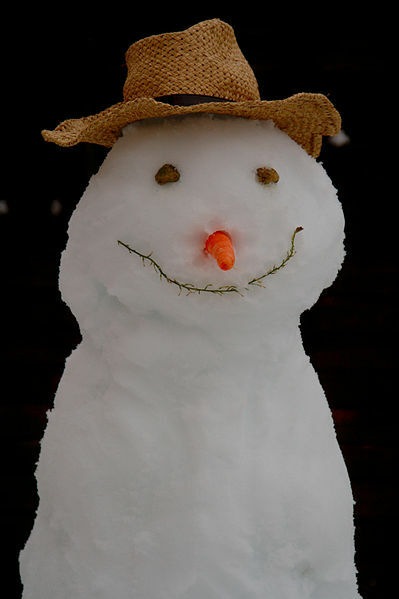 However, I must say that I also once made a pretty impressive snowman. 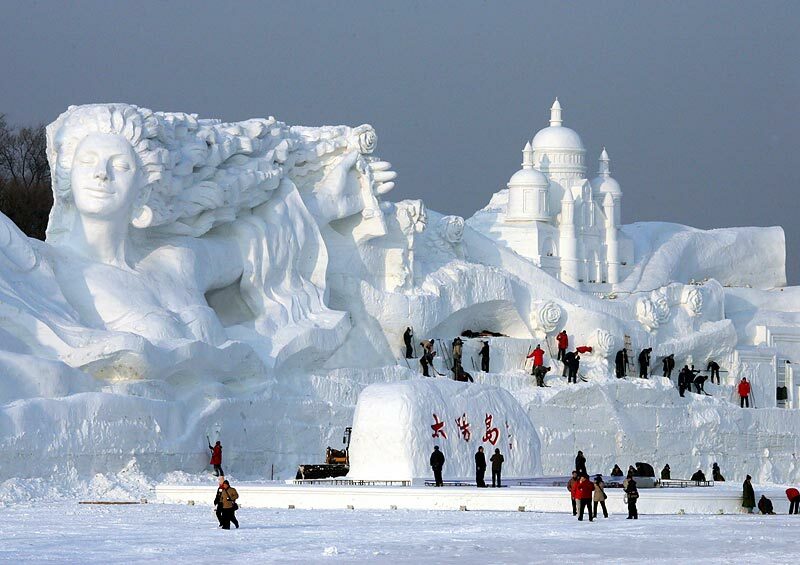 Did you know that China recently made the biggest snow sculpture ever created? Cantueso: Thanks a lot for those pictures of the Chinese ice sculpture. Too bad your snowman and Michelangelo’s were lost. What a fantastic story, thanks so much for sharing! I adore your blog. Thanks mostbeautifulpeopleinart. Good luck on your blog. I suppose that Condivi doesn’t talk about the snowman at all, since as you mention above we don’t know anything else about it. Too bad,as Michelangelo could have described it to Condivi when he was recounting his rebuttal to some of Vasari’s stories. I remember reading the Agony and the Ecstacy years ago, this episode figures in it, but it must have all been from the author’s imagination. Good story. Justme22: No, Condivi says nothing about the snowman. I still haven’t read the Agony and the Ecstacy but I would have guessed Stone made a story out of this one. It’s just too suggestive. Thanks for coming back. I still feel bad about accidentally deleting that long comment of yours on the Sistine cleaning job. I was wondering what comment you were referring to, but if it’s that long comment of mine of Sept. 10th, it’s still there under your post The Sistine Cleaning Job. Otherwise, don’t feel bad about deleting stuff, as we all sometimes get carried away. I should get off the computer now and stop looking out the window at the softly falling snow, and bake those cookies as promised. Best wishes this holiday season and for the new year! Perhaps Leonardo wandered by to draw the snowman- has anyone checked his sketchbooks? Hi zeladoniac: Leonardo was still living in Milan then, working for the Duke of Sforza, so it isn’t likely he would have wandered by. Maybe he and Michelangelo weren’t enemies yet but it’s hard to imagine him copying Michelangelo’s snowman rather than making one of his own (one that maybe danced!). Wish we knew what it looked like! Working for a Medici was like working for Josef Stalin. You better obey orders, or else. Did Michelangelo wear a uniform?That would have been quaint. Haydn wore the Esterhaszi servants uniform. As long as he keeps on delivering these magnificent works of art, circumstances won’t matter.